My Wishlist Wednesday has turned into a Wishlist Saturday and with Black Friday and Blue Monday a distant memory, I wanted to focus on something positive that would also justify a browse around the shops - Valentines gift ideas. I don’t know about everyone else, but I don’t need another teddy bear! Instead, I would love to receive something that I could actually wear that shows off just how well my boyfriend knows me. Introducing Hawes & Curtis. They have been in the shirt making business since 1913 so they know a thing or two about it - and it shows. Not only do they make some stunning classic white shirts that are an absolute must in everyone’s wardrobe, but their fashion shirt range is full of wonderfully bright colours and fabrics. This cute Milly spot fitted shirt is my favourite of their new arrivals. They also have an amazing range of coordinating accessories and added extras that I would totally appreciate, like the burgundy ladies purse…you can never have too many purses! You all know just how much I love a hat and their foldaway trilby is ideal as it doesn’t crush like other hats meaning you can take it away with you on holiday. The leopard print brooch is also a firm favourite that I could add to a scarf or one of my oversized coats for a bit of bling. 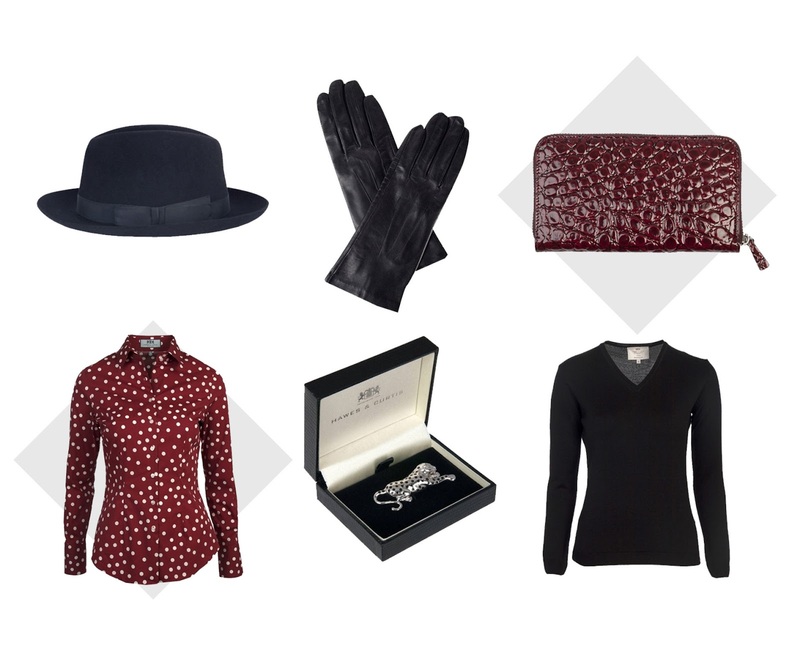 Merino wool is meant to keep you really warm so this black jumper would be ideal in this freezing weather and so would this stunning pair of Dents leather gloves. They are silk lined for extra elegance and would make a welcome addition to my collection. All men need a bit of help now and again and I think subtly drawing up a list like this wouldn’t do any harm to make sure you get something that you can really thank him for!! Have you tried Hawes & Curtis shirts? What do you want this Valentine’s Day? I hope you all have a lovely Valentines Day anyway, whether it be with your partner of with your friends. I've had many galentines over the last few years. Many Valentines spent getting drunk, shaking my thang & waking up wondering why the hell I did that last night haha. This year I have a lovely boyfriend to spend it with - oh so grown up! You look absolutely gorgeous!! In love with your hair! ahh thank you em :) you babe! This is such a cute outfit ! I love the bag a lot !